If the gin is stored in the freezer, the stem is in the freezer, the shaker is in the freezer, and the vermouth is in the refrigerator do I need to shake or stir drink at all? Why not just put it all together in the stem and add the garnish? Water: the drink needs to be properly, though slightly, diluted. One might think this unnecessary since spirits already contain water. After all 100 proof gin is basically 50% ethanol and 50% water right out of the bottle. But that extra bit of water from the ice makes a big difference in taste. Let the countdown begin… 60 days to National Martini Day! Barclay Prime may have one of the best selections of steaks in the US. Certainly in Philadelphia. And, of course, they are prepared perfectly. The ambiance is subdued elegance and the staff is magnificent. It is definitely worth a visit. My martinis were very good: the stems were refrigerated, the mix was perfect, and nicely chilled. The barkeep was professional and not overly chatty. The first martini I ordered was stirred. As you know I prefer my shaken, but I never specify that and if the house standard is ‘stirred’ I go with that. However this time I thought I’d have a bit of fun, so for the second martini I asked the barkeep to shake it. He didn’t bat an eyelash or say a word and went to work on a shaken martini. So I had a martini stirred then one shaken, back to back. An interesting and fun experiment. The shaken martini was definitely colder, but perhaps also a bit more diluted. (I did notice that the barkeep used warm ice in chilling the drink.) They both tasted the same though the stirred drink started out with the silky smooth mouth feel that seems to be driving reason some prefer the stirred versions. Overall the Barclay Prime gets one Martini glass. Both martinis were, indeed, very good, just not quite exceptional. I think that if their stems were well chilled in the fridge it would put them into the coveted two martini realm. Not long ago I was at R2L in Philadelphia for an after dinner drink. R2L is on the 37 floor of Two Liberty Place and has absolutely stunning views to the north and west of Philadelphia. Its incredible at sunset or during a thunderstorm. The food is excellent and the deserts are incredible. However the Martini I ordered was not up to these standards. From the beginning my Martini prep was poor. The barkeep pulled the stem from the shelf and made no attempt to chill stem. It wasn’t stored in the fridge or freezer and there was no effort to chill the glass with ice and water. The drink mix was acceptably dry and mildly shaken. Then placed in a smallish stem with a small bowl. So the drink was cool but not chilled, warming to room temperature very quickly. All for a rather large price. Go for the view, Go for the food, but don’t go for the Martini. Have one if you’re there or order wine. One of my wonderful readers asked if their Gin should be stored in a freezer? Store gin in the freezer? I keep my Vodka in the freezer, so why not the Gin? As I’ve noted several times in past posts I do like my Martini cold and having the gin in the freezer would certainly help keep the drink cold. This would be especially helpful if you’re using warm ice when shaking. But at some point it seems there might be a case of diminishing returns. As I commented earlier about freezer space, perhaps its more important to keep your ice cream there? This one is a toss up in my opinion, if you have plenty of freezer space certainly keep your gin there. Anybody out there like this trend of Martini Stemware without the ‘Stem’? I’ve noticed a number of places serving my Martinis in glassware that is short, almost stubby, with a bulbous ‘foot’, and no noticeable ‘stem’. The bowl is still an inverted triangle shape, but that’s about all that remains of the traditional Martini stem we all ‘grew up’ with. I’m sure it doesn’t change the taste of the drink. And it may actually keep the drink colder longer … see my past posts about cold stems. 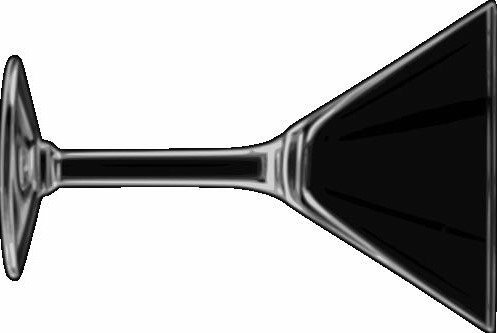 Furthermore, with the lower center of mass it will make the glass less likely to tip over. Would that be a reason the bar is using them? Less breakage? But it just doesn’t seem ‘right’. Maybe I’m too much of a traditionalist, but I don’t think I like this trend. Any comments or thoughts? Ice melts at 32F so we know that ice cannot be warmer than 32F. But it can be colder. Many restaurants’ freezers are set at OF which means ice pulled from a Freezer will be at OF. So? So, cold ice will absorb more heat out of your drink before it starts melting, and diluting, your drink. “Warm” Ice pulled from the bar basin where it’s been sitting, and melting, for a while will start diluting your drink immediately upon being placed in the shaker. In a perfect situation the bar would use cold ice from a freezer in the shaker when preparing the martini (shaken or stirred). The ice would chill the gin and just as it reached 32F, and before it starts to melt, the barkeep would pour your Martini. Fully chilled and totally undiluted.